Das D/D – Thema stellt einen neuen Archetyp dar, welcher in denSets Clash of Rebellion und dem Boosterset Dimension of Chaoseingeführt wird. Dieses Themendeck wurde bereits im Animeeingesetzt, und zwar von Declan. Monster nach berühmten Eroberen wie Leonidas, Alexander und Cäsar benannt. Dementsprechend sind dies auch die mächtigsten Monster dieses Archetyps. Hier haben wir ein Deck, welches in der Lage ist, MASSIVE Fusions- ,Synchro- , XYZ- und Pendelbeschwörungen gleichzeitig durchzuführen. Haupstziel sollte es sein, mithilfe der Themeneigenen ZauberkarteCovenant of the Swamp King DD Overlord Temujin zu rufen, um damiteinen Massiven Angriff einzuleiten. Parallel sollte man die durch dieFusion abgeworfenen DD – Monster mit DD Night Howling zurückholen, umhochstufe Synchros wie DD Overlord Alexander zu rufen. Wenn beideMonster auf dem Feld liegen, kann man viele Spezialbeschwörungenmachen, um so einen Massiven Angriff vorbereiten zu können.Alternativ kann man auch die Pendelmonster, um eine riesige Pendelbeschwörungen von Stufe 1 – 10 (ja richtig, bis 10)durchzuführen. Damit einem bei den ganzen Beschwörungen nicht die Karten ausgehen, hat diese Deck viele Sucher und Recycler zu bieten. DD Lilith gibt uns sowohl Effekt als auch Pendelmonster vom Friedhof / Extra zurück auf die Hand, sodass wir sie erneut nutzen könne. DD Proud Chevalier ist ebenfalls in der Lage, uns Pendelmonster aus dem Extra Deck zu geben. DD Proud Ogre geht ein Stück weiter, er beschwört unsere Pendelmonster direkt vom Deck. Die Covenant-Zauber sind ganz klar das Herzstück des Decks. MitCovenant of the Swamp king haben wir quasi eine permanente MiracleFusion, wohingegen Covenant of the Hellgate eine permanente RotA ohneEinschränkung darstellt. Beide Karten kosten dem Spieler 1000 Lp proZug, aber das wird durch DD d´Arc und DD Leonidas ausgeglichen.Trotzdem sollte man vorsichtig sein.Mit DD Keppler hat man sogar einen Sucher für unsere starken Zauber,und mit DD Zerburus ein Monster, welches unsere Zauber aus demFriedhof zurückholt. Mit DDD Hell Armageddon und DDD Kaiser the Conqueror hat man zweiweitere Bossmonster, welche für den Gegner auf Grund ihre Werte undIhre Effekte große Probleme bereiten werden.... vor allem, wenn mansie auf das Feld pendeln lässt. Das Deck sollte man mit vielen Drawkarten wie Emporkömmling Goblin,Verlock der Finsternis etc. füllen, um schneller an die benötigtenKomboteile zu kommen. Magic Planter ist ebenfalss nutzbar, wenn manneben den Covenant Fallen auch mit Teuflischen Ketten und Ruf derGejagten spielt.Außerdem sind Karten wie MST oder Trap Stun Pflicht, um beim ,,vorrücken“ nicht von gegnerischen Fallen behindert zuwerden. Alternativ kann man auch noch Handzerstörung, Törichtes Begräbnis o.Ä. hinzufürgen, die DD- Monster in den Friedhof legen, und so Night Howler und Convenant of the Swamp King effektiver zu nutzen. Wer ganz Lustig ist, kann auch Hamon, Uria und Raviel spielen. So wird Armitythe auch in einem Deck leicht beschwörbar. If this card is in your hand: You can Fusion Summon 1 "D/D/D" Fusion Monster from your Extra Deck, using monsters from your hand as Fusion Materials, including this card. You can banish this card from your Graveyard; Special Summon 1 "D/D" monster from your hand. You can only use each effect of "D/D Swirl Slime" once per turn. If this card is Normalor SpecialSummoned: You can activate1 of these effects.You can only use this effect of "D/D Lilith" once per turn. ● Target1 "D/D"monster inyour Graveyard;add that targetto your hand. ●Add 1 face-up"D/D" PendulumMonster Card from your Extra Deck to your hand. When this card is destroyed by battle and sent to the Graveyard,or when this card in your possession is destroyed by anopponent's card effect and sent to your Graveyard, if you control no cards: You can draw 2 cards. monsters, also Special Summon that target, but its ATK and DEF become 0. If that monster is destroyed, take 1000 damage. If this card is in your hand or Graveyard: You can send 1 "D/D" or "Dark Contract" card from your hand or face-up from your side of the field to the Graveyard, except "D/D Lamia"; Special Summon this card, but banish it when it leaves the field. You can only use this effect of "D/D Lamia" once per turn. If this card is Pendulum Summoned: Negate the effects of all face-up cards your opponent currently controls, until the end of this turn. Once per turn, if this card was Pendulum Summoned this turn: You can target up to 2 cards in your Spell & Trap Zone; destroy them, and if you do, this card gains 1 additional attack for each card destroyed by this effect during each Battle Phase this turn. You can discard 1 card; this card gains 500 ATK until the end of this turn, then you can destroy 1 Spell/Trap Card on the field. When this card is Pendulum Summoned from your hand while you control a "D/D" monster, except "D/D Cerberus": You can target 1 Continuous Spell Card in your Graveyard; add it to your hand. Once per turn: You can target 1 Spell/Trap Card on the field and 1 other "D/D" or "Dark Contract" card you control; destroy them. When you take damage: You can Special Summon this card from your hand. After you Special Summon this card, you cannot Special Summon monsters for the rest of this turn, except Fiend-Type monsters. You cannot Pendulum Summon monsters, except "D/D"monsters. This effect cannot be negated. During each of your Standby Phases: Increase this card's Pendulum Scales by 2 (max. 10), then destroy all monsters you control whose Levels are lower than this card's Pendulum Scales, except "D/D" monsters. During either player's turn: You can discard this card, then target 1 "D/D" card or 1 "Covenant" card you control; return that target to the hand. You can only use this effect of "D/D Magical Astronomer Galilei" once per turn. You cannot Pendulum Summon monsters, except "D/D" monsters. This effect cannot be negated. During each of your Standby Phases: Reduce this card's Pendulum Scale by 2 (min. 1), then destroy all monsters you control whose Levels are higher than this card's Pendulum Scales, except "D/D" monsters. If this card is Normal or Special Summoned: You can activate 1 of these effects. You can only use this effect of "D/D Magical Astronomer Kepler" once per turn. ●Target 1 other "D/D" card you control; return that target to the hand. Add 1 "Covenant" card from your Deck to your hand. You cannot Pendulum Summon monsters, except "D/D" monsters. This effect cannot be negated. If a Trap effect that would inflict damage to you activates, before resolving that effect, you can negate that effect, then destroy this card. This effect can only be used once while this card is in the Pendulum Zone. You can discard this card, then target 1 "D/D" or "Dark Contract" card in your Graveyard, except "D/D Savant Newton"; add it to your hand. You can only use this effect of "D/D Savant Newton" once per turn. You cannot Pendulum Summon monsters, except "D/D" monsters. This effect cannot be negated. If a Spell effect that would inflict damage to you activates, before resolving that effect, you can negate that effect, then destroy this card. This effect can only be used once while this card is in the Pendulum Zone. If this card is Normal or Special Summoned: You can send 1 "D/D" or "Dark Contract" card from your Deck to the Graveyard, except "D/D Savant Copernicus". You can only use this effect of "D/D Savant Copernicus" once per turn. Once per turn: You can pay 500 LP, then target 1 face-up monster your opponent controls; it loses 500 ATK. Unless you have a "DD" card in your other Pendulum Zone, this card's Pendulum Scale becomes 5. Once per turn: You can pay 500 LP, then target 1 "D/D" monster you control; it gains 500 ATK. Unless you have a "D/D" card in your other Pendulum Zone, this card's Pendulum Scale becomes 5. 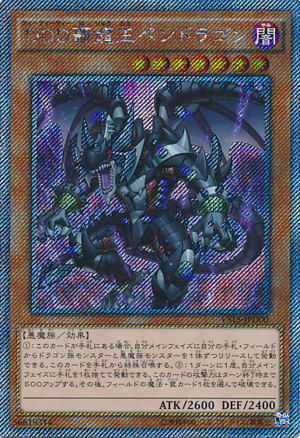 When this card is Normal Summoned: You can activate this effect; you cannot Special Summon monsters for the rest of this turn, except "D/D" monsters, also Special Summon 1 face-up DARK Pendulum Monster from your Extra Deck, but its effects are negated. Once per turn: Youcan target 1 "D/D"monster you control; it gains 800 ATK until the end of this turn. Once per turn, if a monster(s) you control is destroyed by battle or by card effect: You can target 1 of those monsters; this card gains ATK equal to that monster's original ATK until the end of this turn. This card cannot attack directly the turn you activate this effect. Cannot be destroyed by Spell/Trap effects that do not target it. If you Special Summon a "D/D" monster(s), except during the Damage Step: You can target 1 "D/D" monster in your Graveyard; any battle damage your opponent takes is halved for the rest of this turn, also Special Summon it, and if you do, take 1000 damage. You can only use this effect of "D/D/D Oblivion King Abyss Ragnarok" once per turn. If this card is Normal or Special Summoned: You can target 1 "D/D/D" monster in your Graveyard; Special Summon it. You can only use this effect of "D/D/D Oblivion King Abyss Ragnarok" once per turn. Once per turn: You can Tribute 1 other "D/D" monster you control, then target 1 monster your opponent controls; banish it. When you take damage from a card effect (except during the Damage Step): You can destroy this card, and if you do, any effect that would inflict damage increases LP by the same amount instead for the rest of this turn. When you take damage from a card effect (except during the Damage Step): You can Special Summon this card from your hand, and if you do, gain LP equal to the damage you took. You take no effect damage. You can banish 2 "D/D" monsters from your Graveyard; Special Summon this card from your Pendulum Zone. During your opponent's turn, if this card is in your hand or Graveyard: You can target 2 face-up Spell/Trap Cards you control; you cannot Special Summon monsters for the rest of this turn, except Fiend-Type monsters, also destroy those targets, and if you do, Special Summon this card (this is a Quick Effect). You can only use this effect of "D/D/D Wisdom King Chaos Apocalypse" once per turn. You can only use the Pendulum Effect of “D/D Savant Thomas” once per turn. (1) During your Main Phase: You can activate this effect; Add to your hand 1 face-up “D/D” Pendulum Monster from your Extra Deck. You can only use this Pendulum Effect of “D/D Savant Thomas” once per turn. You can only use the Monster Effect of “D/D Savant Thomas” once per turn. 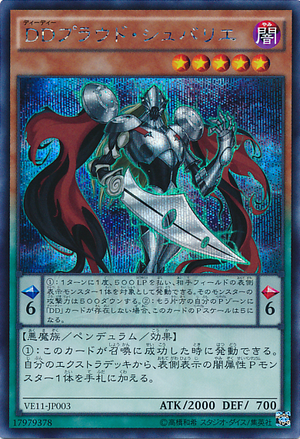 (1) You can target 1 “D/D” card in your Pendulum Zone; any battle damage your opponent takes becomes halved for the rest of this turn, also destroy it, and if you do, Special Summon in Defense Position 1 Level 8 “D/D/D” monster from your Deck, but its effects are negated this turn. 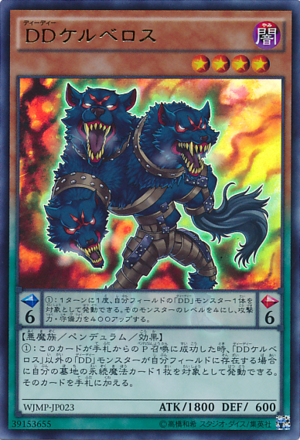 If a "D/D" monster(s) is Special Summoned to your side of the field, except this card (except during the Damage Step): You can target 1 "D/D" monster in your Graveyard; Special Summon that target. You can only use this effect of "D/D/D Temujin the Blaze Overlord" once per turn. If this card is destroyed by battle, or if this card in your possession is destroyed by an opponent's card effect: You can target 1 "Covenant" card in your Graveyard; add that target to your hand. Any effect that would inflict damage to you increases your LP by the same amount, instead. Once per turn, when an attack is declared involving this card: You can target 1 other "D/D" or "Covenant" card you control; return it to the hand, and if you do, equip 1 face-up monster your opponent controls to this card, except the monster this card is battling. This card gains ATK equal to the total original ATK of the monsters equipped to it by this effect. If a "D/D" monster you control attacks a Defense Position monster, inflict piercing battle damage to your opponent. Once per turn, during your Standby Phase: You can destroy all cards in each player's Spell & Trap Zones. If a "D/D" monster(s) is Normal or Special Summoned to your side of the field, except this card (except during the Damage Step): You can target 1 Level 4 or lower "D/D" monster in your Graveyard; Special Summon that target. You can only use this effect of "D/D/D Alexander the Gale Overlord" once per turn. During either player's turn: You can target 1 face-up Spell/Trap Card on the field; negate its effects until the next Standby Phase. You can only use this effect of "D/D/D Cursed King Siegfried" once per turn. When this card is destroyed by battle or card effect and sent to the Graveyard: Gain 1000 LP for each "Dark Contract" card you control. 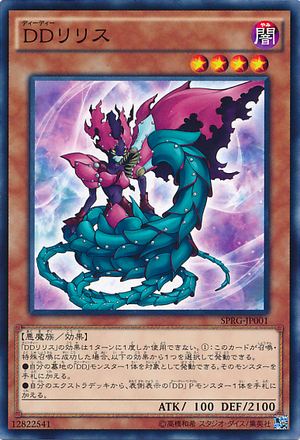 Youcan also Xyz Summon this card by using a Rank 4 "D/D/D" Xyz Monster you control as the Xyz Material. 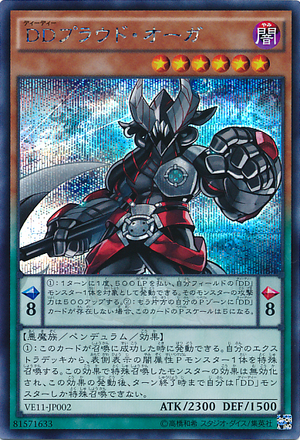 (Xyz Materials attached to that monster also become Xyz Materials on this card.) Once per turn, during either player's turn, if you took effect damage this turn: You can detach 1 Xyz Material from this card, then target 1 face-up monster on the field; it loses 1000 ATK and DEF, and if it does, inflict 1000 damage to your opponent. If this card is sent from the field to the Graveyard: You can send 1 "D/D" or "Covenant" card from your Deck to the Graveyard. You can detach 1 Xyz Material from this card; at the end of this turn's Battle Phase, Special Summon as many monsters from your Graveyard as possible that were destroyed during this turn, and if you do, you take 1000 damage for each monster Special Summoned by this effect during the next StandbyPhase. If this card is sent from the field to the Graveyard: You can add 1 "Covenant" card from your Deck to your hand. You can only use each effect of "D/D/D Caesar the Wave Overlord" once per turn. You can detach 1 Xyz Material from this card; destroy all Spell and Trap Cards on the field. You can detach 1 Xyz Material from this card, then target 1 "Covenant" Spell/Trap Card in your Graveyard; Set that target. During your Main Phase: You can Fusion Summon 1 Fiend-Type Fusion Monster from your Extra Deck, using monsters from your hand or your side of the field as Fusion Materials. 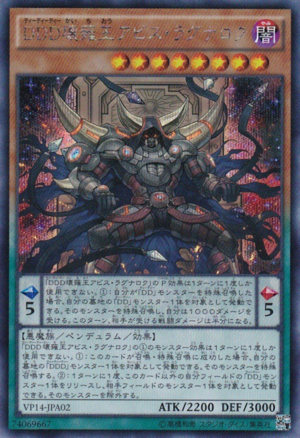 If you would Fusion Summon a "D/D" Fusion Monster, you can also banish monsters from your Graveyard as Fusion Materials. You can only use this effect of "Covenant with the Swamp King" once per turn. During each of your Standby Phases: Take 1000 damage. During your Main Phase: You can add 1 "D/D" monster from your Deck to your hand. You can only use this effect of "Covenant with the Hellgate" once per turn. During each of your Standby Phases: Take 1000 damage. You can activate 1 of these effects. You can only use this effect of "Dark Contract with the Yamimakai" once per turn. ● Target 1 "D/D" Pendulum Monster in your Graveyard; place it in your Pendulum Zone. ● Place 1 face-up "D/D" Pendulum Monster in your Extra Deck in your Pendulum Zone. Once per turn, during your Standby Phase: Take 1000 damage. You can send 1 "D/D" or "Covenant" card from your hand to the Graveyard, then target 1 card on the field; destroy it. You can only use this effect of "Covenant with the Valkyrie" once per turn. All Fiend-Type monsters you control gain 1000 ATK during your opponent's turn only. During each of your Standby Phases: Take 1000 damage. Once per turn, if you control a "D/D" monster: You can negate all Trap Card effects on the field (other than this card's) for the rest of this turn (even if this card leaves the field). Once per turn, during your Standby Phase: Take 1000 damage. "Dark Contract" cards you control cannot be destroyed by your opponent's card effects. You can banish this card from your Graveyard, then target up to 3 of your banished "D/D" cards, except this card; shuffle them into the Deck. If your opponent controls more monsters than you do: Target any number of "D/D" monsters and/or "Covenant" cards in your Graveyard, up to the difference in number of monsters; add them to your hand. You can only activate 1 "D/D Recruit" per turn. Shuffle 3 cards among the "D/D" monsters in your hand, field and Graveyard and/or the "D/D" cards in your Pendulum Zone into the Deck, then you can add 2 "D/D" monsters from your Deck to your hand. Destroy as many"Covenant" cards in your Spell & Trap Zones as possible, and if you do, draw 1 card for each card destroyed, then gain 1000 LP for each card drawn. ● Banish 1 "D/D/D" monster from your Graveyard, and if you do, the attacking monster loses ATK equal to the banished monster's ATK. 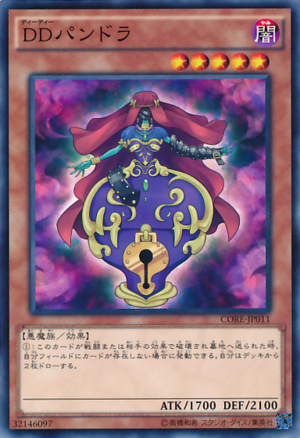 ● Add 1 Level 4 or lower "D/D" Pendulum Monster from your Deck to your hand. Endlich gibt es so einen Thread, hab ihn schon die ganze Zeit erwartet! Werde dieses Deck 100%ig spielen, einfach weil es soviele möglichkeiten gibt es zu spielen. Ich denke dieses deck sprengt die Grenzen in jedem Verhältnis alles daran ist einfach nur krass krank: artworks, Möglichkeiten, Ressourcenmanagement, erforderlicher skill, artworks. ich habe mir vorgenommen mir dieses deck mal anzusehen aber ich hab wenig Hoffnung dieses deck zu meistern, sonst spiele ich bloß so Sachen wie deskbot, u.a. oder superheavy sams also nichts das es auf Ebene des hirnanspruchs mit DDD aufnehmen kann. Ist eins der wenigen Decks, die mir wirklich gefallen. Spielt sich wirklich gut und macht echt spaß, wenn man sich damit auseinandergesetzt hat. Ich bin mir nur nicht sicher, wann diese Karten bei uns erscheinen. Zwar kommen in Clash of Rebellions 3 Karten, sind aber bisher nur fürs OCG bestätigt. Vorallem der Sniper, macht nur Sinn, wenn vorher Caesar als 4er xyz Monster erschienen ist, da sonst sein Effekttext verändert werden müsste. War das Deck anfänglich nicht Korea only ? I might be back! Or not! Du bist wirklich nur son kleiner Hater, der von nichts ne Peilung hat, kann das sein? Selbst wenn die Igknights nicht mehr ihre Ultra Combo haben, sind sie dennoch recht stark, wenn eben auch nicht so wie mit der Beetle Combo. Du bist wahrscheinlich nur son kleines Kind, welches im Internet nach Aufmerksamkeit sucht. Yay jemand hatet. Haten wir ihn ... man leute beibt doch bitte einmal sachlich und lasst euch nicht von jedem furz provozieren... Wen er die meiung hat soll er halt. wenn er beleidigend wird ruft nen mod. das is aber kein grund persoehnlich zu werden. Ich finde das Deckthema sehr interessant. Vielleicht kann man darin auch Clownblade spielen, nur so ne Idee. Habe mich noch nicht sehr mit dem Deckthema beschäftigt. Das muss man nicht unbedingt das ddd Thema ist schon groß genug auf glatte 40 kommen wird da sowieso schwer. Obwohl es sich mit den ganzen Abkommens/Bündnis Z/F irgendwie schon lohnt. Ps ich weiß was igknights können (das einzige was die können sind xyz Spam (infinity) und stun plays (heatwave, agonie des tyrannen und Co.) und ja ich bin 14. Also und ich hate igknights nicht ich sage sachlich das Sie halt nichts wirklich besonderes machen was ich als "Anspruchsvoll" definiere. So jetzt kannst du weiter haten ToBakai. hat das deck in japan schon was gerissen? in welchen set erscheint es bei uns? starter deck oder? Das deck is auch leider gegen massenzerstoerer anfaellig. An sonsten halte ich es aber fuer sehr spielstark. DDD Endkönig Armageddon wirkt dem zumindestens etwas entgegen. Ansonsten muss ich dir da Recht geben, wenigstens hat man gute Chancen, wenn man kein OTK reingedrückt bekommt, das Feld wieder schnell zu füllen mit den nötigen Monstern, hart finde ichs eher wenn man uns Zauber/Fallen und Monster in einem Zug nimmt bzw stark dezimiert. You just witnessed an instant classic! Dauert es bei euch auch so lange ein ordentliches Feld aufzubauen? Sobald die Pendler oder die Verträge zerstört werden ist immer ziemlich Endstation, kann ich dem iwie entgegenwirken? Spiele derzeit eine ähnliche Liste wie die Otk Variante in der Beschreibung. ich habe kein Problem damit ein Feld aufzubauen. Die Verträge brauch man meiner Meinung nach nur am Anfang. Gegen später reicht eigt einmal der Turm um wieder ein komplettes feld aufzubauen. so sieht meistens mein Eröffnungszug aus. Ar,mageddon kann auch alles andere sein. Wenn ich Keppler nicht habe, habe ich immernoch searchkarten und one for one etc. Falls das Feld mal geleert wird kann lilith und Nachtheuler auch wieder ganz schnell das zeug zusammen holen. Kann aber auch sein das es bessere Züge gibt ^^ Also wenns gut läuft kann ich in einem Zug meine gesamte Hand aufs Feld bringen. Ich finde Keppler ist so der Dreh und Angelüunkt da er die die Bündniskarten zusammen sucht, ihn kannst du ja mit Lilith auch vom extradeck wieder auf die Hand nehmen.